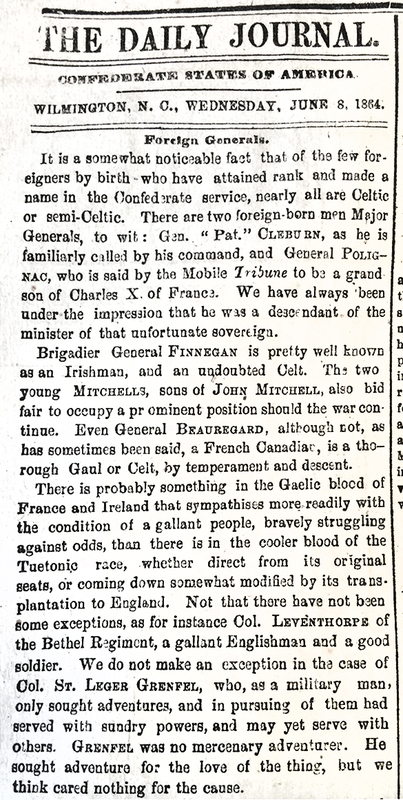 Item Description: “Foreign Generals,” (editorial), The Daily Journal (Wilmington, N. C.), 8 June 1864. WILMINGTON, N. C., WEDNESDAY, JUNE 8, 1864. It is a somewhat noticeable fact that of the few foreigners by birth who have attained rank and made a name in the Confederate service, nearly all are Celtic or semi-Celtic. There are two foreign-born men Major Generals, to wit : Gen. ” Pat.” CLEBURN, as he is familiarly called by his command, and General POLIGNAC, who is said by the Mobile Tribune to be a grand son of Charles X of France. We have always been under the impression that he was a descendant of the minister of that unfortunate sovereign. Brigadier General FINNEGAN is pretty well known as an Irishman, and an undoubted Celt. The two young MITCHELLS, sons of JOHN MITCHELL, also bid fair to occupy a prominent position should the war continue. Even General BEAUREGARD, although not, as has sometimes been said, a French Canadian, is a thorough Gaul or Celt, by temperament and descent. There is probably something in the Gaelic blood of France and Ireland that sympathises more readily with the condition of a gallant people, bravely struggling against odds, than there is in the cooler blood of the Teutonic race, whether direct from its original seats, or coming down somewhat modified by its transplantation to England. Not that there have not been dome exceptions, as for instance Col. LEVINTHORPE of the Bethel Regiment, a gallant Englishman and a good soldier. We do not make an exception in the case of Col. ST. LEGER GRENFEL, who, as a military man, only sought adventures, and in pursuing of them had served with sundry powers, and may yet serve with others. GRENFEL was no mercenary adventurer. He sought adventure for the love of the thing, but we think cared nothing for the cause. We do not know of a single general of foreign birth, that has attained any reputation in the Northern armies, although there are so many foreign soldiers in the ranks. SEIGEL and the other German generals have been failures about equally with the Irish generals like MEAGHER, CORCORAN and others. These were poitical appointments, the Germans being Red Republicans, and the Irish “Fenians,” or some such thing. 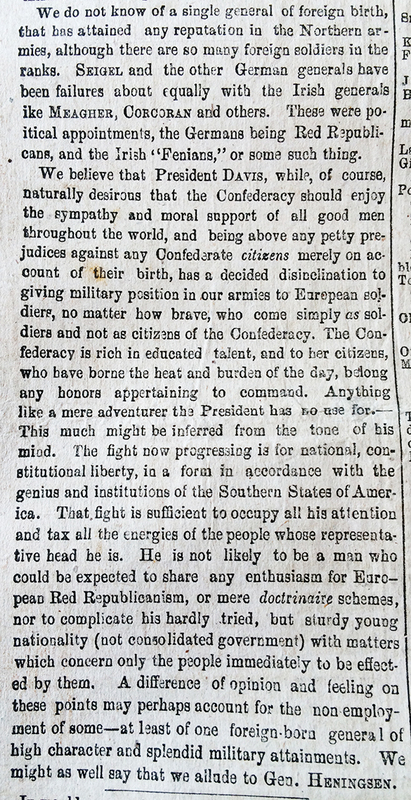 We believe that President DAVIS, while, of course, naturally desirous that the Confederacy should enjoy the sympathy and moral support of all good men throughout the world, and being above any petty prejudices against any Confederate citizens merely on account of their birth, has a decided disinclination to giving military position in our armies to Eurepean soldiers, no matter how brave, who come simply as soldiers and not as citizens of the Confederacy. The Confederacy is rich in educated talent, and to her citizens, who have borne the heat and burden of the day, belong any honors appertaining to command. Anything like a mere adventurer the President has no use for.—This much might be inferred from the tone of his mind. The fight now progressing is for national, constitutional liberty, in a form in accordance with the genius and institutions of the Southern States of America. That fight is sufficient to occupy all his attention and tax all the energies of the people whose representative head he is. He is not likely to be a man who could be expected to share any enthusiasm for European Red Republicanism, or mere doctrinaire schemes, nor to complicate, his hardly tried, but sturdy young nationality (not consolidated government) with matters which concern only the people immediately to be effected by them. A difference of opinion and feeling on these points may perhaps account for the non employment of some—at least of one foreign-born general of high character and splendid military attainments. We might as well say that we allude to Gen. HENINGSEN. Item Citation: editorial, The Daily Journal (Wilmington, N.C.), 8 June 1864, page 2, column 1. Call number C071 Z, North Carolina Collection, Wilson Library, University of North Carolina at Chapel Hill. This entry was posted in North Carolina Collection and tagged Brigadier General Joseph Finnegan, Celtic, Collett Leventhorpe, foreigners, General P.G.T. Beauregard, George St. Leger Grenfell, Germans, Irish, Jefferson Davis, John Mitchell, Major General Patrick Cleburne, Michael Corcoran, Red Republicans, Thomas Francis Meagher. Bookmark the permalink.